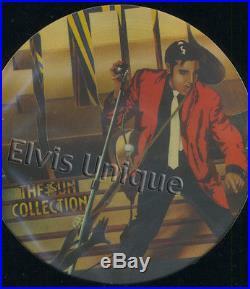 The Sun Collection Promo One-Of-A-Kind RCA Picture Disc LP Larger image below. Rarest Elvis One-Of-A-Kind Picture Disc Album. Mint - This rare one-of-a-kind experimental picture disc in-house test pressing features the original LP artwork from the front and back cover. This long playing album may or may not feature Elvis singing. Because of its rarity we will not play it. The Colonel actually had this LP and other titles produced as a potential RCA Elvis promotion in the early 70's. For whatever reason RCA or The Colonel decided against the project making this album one of the rarest Elvis Presley picture discs in the world. RCA never sealed this LP. Note: RCA never sealed this LP. Customers Residing In The UK. Do not ask for a low value! This is written in stone!!! Paul Lichter's Elvis Unique Record Club was founded in 1970 and has been supplying Elvis fans worldwide for four decades. Paul has written 30 books about his friend Elvis and has often been called the world's leading Elvis authority. Once you leave feedback for us we will respond by leaving feedback for you within 24 hours. We care and will always take that extra measure to satisfy you. Elvis Unique Record Club 10933 East Elmwood Street Mesa, AZ 85207. The item "Elvis Presley The Sun Collection Promo One-Of-A-Kind RCA Picture Disc LP" is in sale since Monday, May 08, 2017. This item is in the category "Music\Records".com" and is located in Mesa, Arizona. This item can be shipped worldwide.